Donald Trump got a glimpse of his own future today when he watched Michael Cohen sentenced to significant prison time for having carried out two felonies at Trump’s instruction. There is no longer any doubt that Trump will be indicted for these same two felonies at some point, and we’re soon going to hear about dozens of other Trump felonies as well. So what was Trump’s response when he saw Cohen go down? Publicly, Donald Trump said nothing. He spent the first part of the day refusing to get out of bed, according to NBC News. When he finally did surface in public during the second half of the day, reporters shouted questions about Cohen at him, but he ignored them. Then, finally, Trump made a private remark about Cohen which ended up leaking. 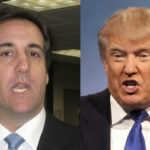 Trump’s private reaction to Cohen’s sentencing consisted of just three words, according to CNN: “He’s a liar.” Well, duh. Michael Cohen is such a liar, he ended up pleading guilty to having lied to Congress. The whole point here, as acknowledged by numerous legal observers, is that the SDNY wouldn’t have formally accused Trump of felonies on Friday if it were relying on just Cohen’s word. This means prosecutors have hard proof of Trump’s guilt. Then there’s the fact that Donald Trump is such a consistent liar, he makes Michael Cohen look relatively honest in comparison. The Washington Post, which categorizes the severity of lies based on a “Pinocchio” rating, recently decided that Trump’s lies have grown so egregious, it’s had to come up with a new “Bottomless Pinocchio” category. The most surreal part is that Trump knew Cohen was telling the truth today when he branded him a liar.